Phineas Poe, disgraced cop turned psychiatric case, turned murder suspect, turned reluctant kidney donor, gives $200 to a beautiful woman in a red dress, a scar at the edge of her mouth and a body like a knife. He then wakes up in a bath of melting ice, blood on his fingers and staples in his sides. Now she haunts his dreams and his days. She’s got his kidney on ice and her teeth in his heart. Finding her means throwing himself into a drug-blurred underworld. Falling in love with her means fighting to avoid becoming her accomplice as well as her victim. 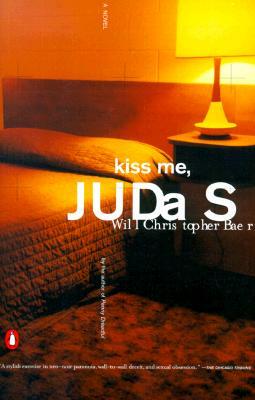 Fast, corrosive wit, glittering, razor-sharp images, a cast of comic and sinister characters, part love story, part mystery, part hallucination, Kiss Me, Judas is a startling novel of modern noir. Will Christopher Baer was born in 1966 in Mississippi and grew up in Memphis, Tennessee. He has won fiction prizes from Story Magazine and has published work in Bomb and Nerve. He lives in California.